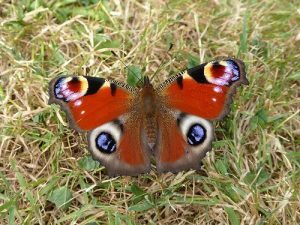 For all our members and friends who record the butterflies in your garden for Butterfly Conservation Ireland’s recording scheme, this is a reminder to keep a keen watch on what’s happening in your garden. 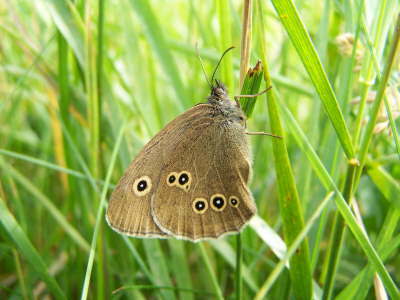 The records we need are the date/s you first see the butterfly in each three month period (March-May, June-August, September-November) At the end of the season you record the peak number and date/s this peak was reached for the entire recording period. 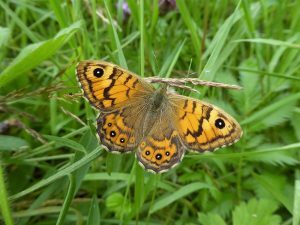 The completed form, with any comments is returned to: Butterfly Conservation Ireland, Pagestown, Maynooth, County Kildare. A report based on the surveys will appear in our annual report posted in hard copy and on-line. The weather has been very erratic this month with some lovely conditions such as the warm sunshine and light breezes of Sunday August 13th and the heavy rain the next day. When there is a sunny window in the weather, especially sunshine following a day or several days of rain, I urge you to get out in your garden and observe what’s happening. 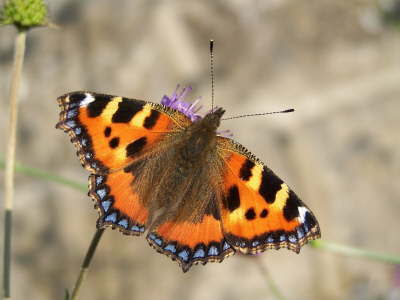 Butterflies often show a burst of activity when sunny weather follows a period of heavy rain, rather like a burst of birdsong in spring when a cloudburst exhausts its downpour. 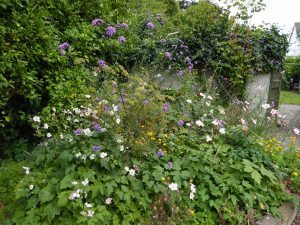 On Sunday morning (August 13th) I spent time in the garden, relaxing among my tall, now rather unruly meadow dominated right now by Common Knapweed. 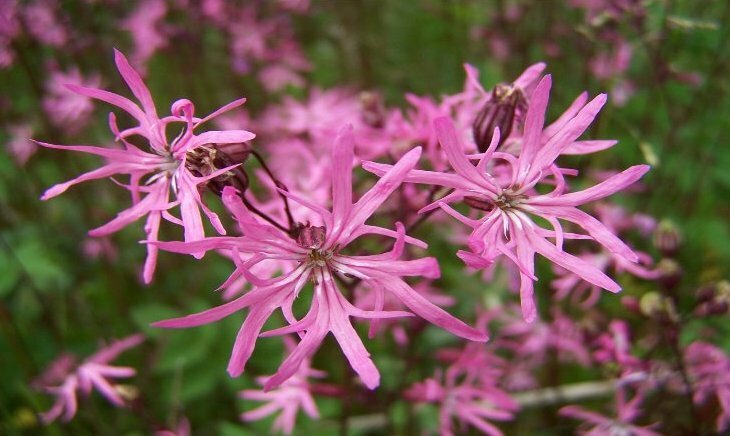 This multi-stemmed, multi-flowering native perennial is a magnet for nectar-loving insects and later, for seed-eating birds. 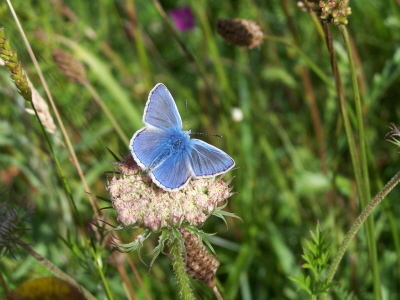 It has been in flower since June but is peaking now, just when the peak butterfly populations are in play. Timing is everything with butterflies. The first Holly Blue Celastrina argiolus to visit me this year showed up at the end of May, too late to breed on my holly plants, grown specially for her. But she is fussy, only laying on holly in flower, not on plants already in berry. The caterpillars can only tackle very young, tender berries so the mother selects the flower as egg-site. How she knows this I am unsure, but chemical receptors on her feet, palps, antennae and thorax might be able to test for the presence of the nutrients needed. She sometimes gets it wrong though, and deposits eggs on the flowers on male holly, which will never produce a berry. My visitor was in luck. The hollies were off the menu, but my Alder Buckthorns were in flower and soon she used this unusual food plant. 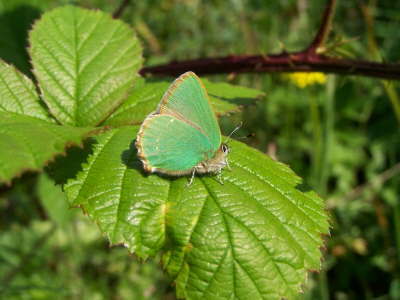 The choice paid off, and on Sunday freshly emerged Holly Blues fluttered around my hedges, especially around an old Common Hawthorn, crowned with dense flowering Common Ivy, the species main late summer and autumn food plant. A result, I tell myself! The Peacock’s Inachis io breeding requirements and life cycle is less complicated. It has one brood per year and one larval food plant, Common Nettle. A nettle patch growing in a warm, unshaded sheltered recess typically in a clearing/track in a wood, at the edge of a wood or against a south facing hedge is used. These multi-coloured emblems of August are adorning my knapweeds, adding glamour to my garden. (Are they rare? I’ve been asked. Surely something so gaudy must be scarce). I counted 16 on Sunday! This for me is three short of my Peacock record of a couple of years ago. Will I equal or even surpass 19? We’ll see. At the moment, they look very content, moving gently from bloom to bloom, gorgeous with wings fully extended, black shark fin-shaped undersides when heat dictates wing closure. 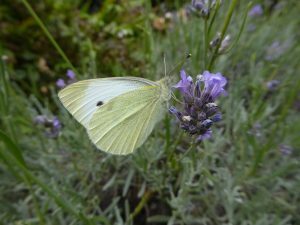 The whites are a sharp counterpoint to the multicoloured Peacock, the Large Whites Pieris brassicae are enjoying a boom this summer. 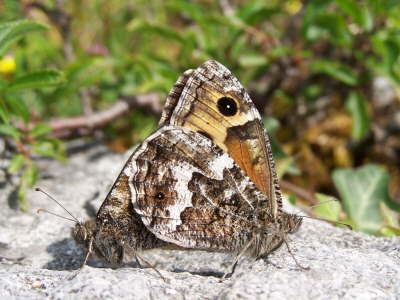 The sexes look similar but the female has two prominent parallel black spots on the upper surface of her forewings which are clear white in the male. 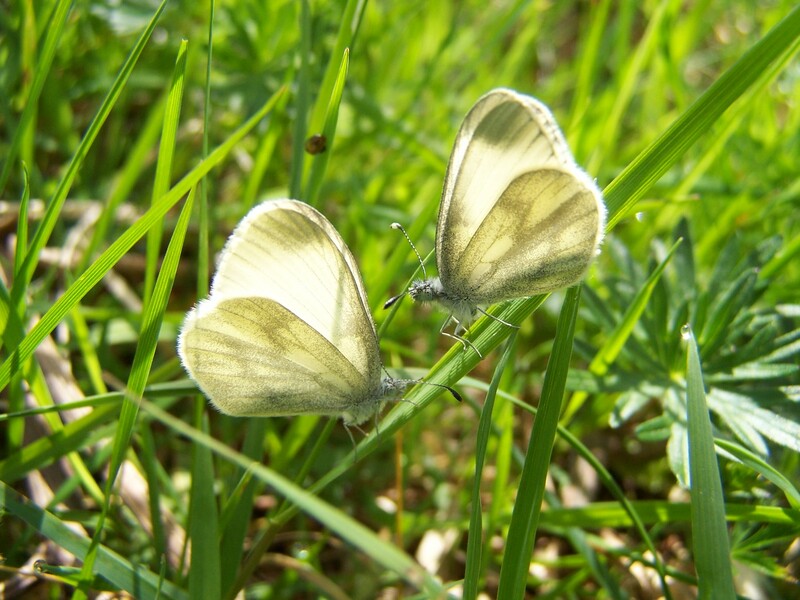 These are very skittish, easily disturbed and disruptive, chasing any other white or pale butterfly as they check the mating possibilities. In my garden they are just re-fueling, but a neighbour grows nasturtiums, one of the larval food plants. The Small Whites Artogeia rapae are about too. 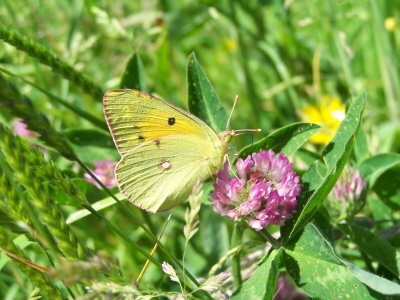 These look like smaller versions of Large White, but taxonomists have proposed that these two “cabbage whites” are not as closely related as previously thought, mainly due to differences in chromosome number, egg-laying behaviour (solitary in Small White, gregarious in Large White) and larval survival strategy (reflected in morphology (larvae of Small White and close relatives are green and rely on camouflage; Large White larvae are black, white, yellow and conspicuous, relying on display of warning colours), behaviour (solitary in Small White) and biochemistry (Large White larvae are strongly distasteful, arising from a concentration of mustard oils containing suphur assimilated from the larval food plant)). 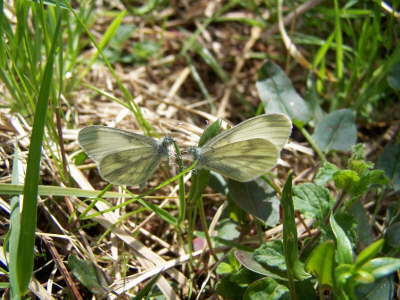 These differences are reflected in the reassignment of Small White and Green-veined White from the genus Pieris to Artogeia. 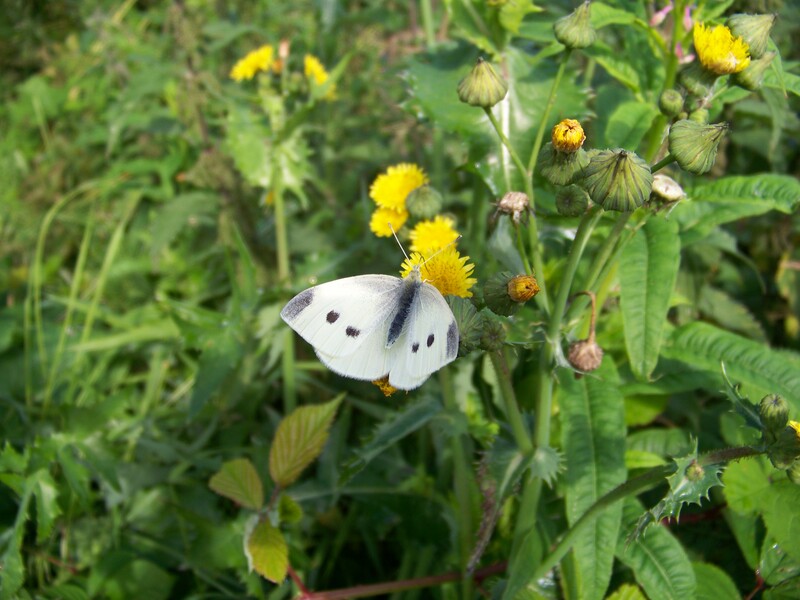 However, none of this taxonomic refinement/redefinition bothers the Large White, which inspects and is inspected by Small Whites as males seek mates. 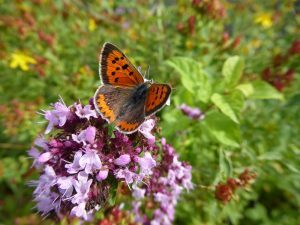 The tiny gem that is the Small Copper Lycaena phlaeas is my garden favourite. A male has taken up residence, and has seen off another male. He carries out regular inspections of the garden, surveying his kingdom from specific vantage points, like a Medieval king using his castles as strongholds from which to exert his authority. Any upstart is assaulted and driven off. 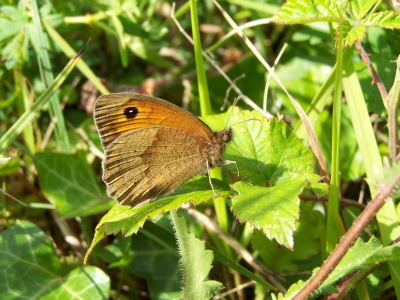 While I can hardly blame him, his activities lower my Small Copper count! A rather lazy Red Admiral is hanging around at the moment, but he is so bedraggled as to be barely there, yet he still insists on helping himself to the buddleia. There will be fresh specimens later in the season and, like the Peacock, I never tire of taking photos of this handsome yet familiar butterfly. 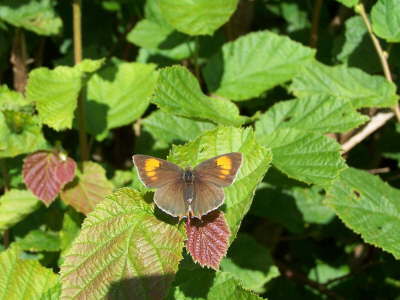 No previous experience of butterfly gardening prepared me for the appearance of the endangered Wall Brown. 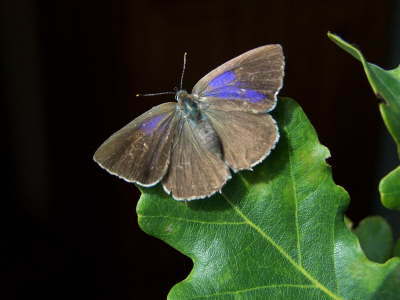 This most attractive member of the brown family of butterflies has declined catastrophically since the mid-1980’s (heavier rainfall? change from hay to silage? increased chemical inputs?). A pristine female visited my garden, sipped on a knapweed, basked and fled. I have never seen this species in an Irish garden, so am delighted that I was there to see her. I just hope she finds a mate and settles in the area! All these photographs were taken in gardens. Keep watching! Nectar: Verbena bonariensis and Fennell.©J.Harding.